Egyptian Abdelrahman Ahmed Shaalan is the first African sumo wrestler in Japan. Can he make an impact? 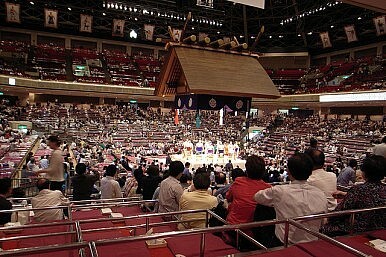 Sumo is seen around the world as the archetypal Japanese experience, but even as it has been hit by scandal at home, it’s growing as an international sport. And on Tuesday, the first ever African wrestler made his debut in Osaka. Abdelrahman Ahmed Shaalan hails from Egypt and is perhaps better known as Osunaarashi. These days, there are no less than 45 wrestlers who have been born overseas. Wrestlers from Mongolia have enjoyed a good deal of success in recent years, but there are others from Russia, Kazakhstan and even Brazil. Hakuho of Mongolia is currently the number one, with 21 Emperor Cups to his name. His countryman, bad boy Asashōryū, was a star in the previous decade before retiring in 2010. Estonian Baruto Kaito has his sights set on the top spot too. Each “stable,” is allowed to have only one foreign born athlete, and the Otake stablemaster noted to local media that Osunaarashi was happy to come to Japan in the aftermath of the earthquake and tsunami and the scare over the nuclear power plant at Fukushima. The new star will also have to juggle the demands of this physical sport during the Muslim holy month of Ramadan. All this is good news for a sport whose image has been badly tarnished in recent years, notably in a match-fixing scandal last year in which 13 wrestlers were implicated. It caused the first cancellation of a grand tournament for over 60 years.